Heart disease is the leading cause of death in the US and around the world, and hand-in-hand with heart disease goes the often demonized cholesterol. Standard medical advice on ideal cholesterol levels and cardiovascular disease is often confusing, ever-changing, and sometimes downright contradictory. 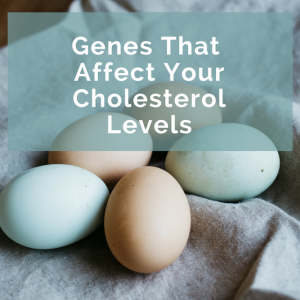 Here is a look at some of the ways our genes are involved in either high or low cholesterol levels and at the evidence from research studies on the effects of high or low cholesterol. So what is the role of cholesterol in the body? 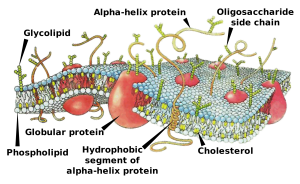 Cell membrane showing cholesterol molecules within the phospholipid bilayer. Wikimedia Commons. Cholesterol is a type of lipid (fat) that is created in by all animals and is an essential part of the cell membrane structure. Every cell in our body is surrounded by a membrane composed mainly of phospholipids. Cholesterol molecules also make up part of the cell membrane, stabilizing the membrane to help maintain the integrity of it. It keeps the membrane firm enough to keep some very small water-soluble molecules out, but yet not too rigid. All-in-all, a vital component of each cell in our body. Like most things in the body, it is a matter of having neither way too much nor too little cholesterol. The right amount is personal to each of us, depending on our genes and our diet. 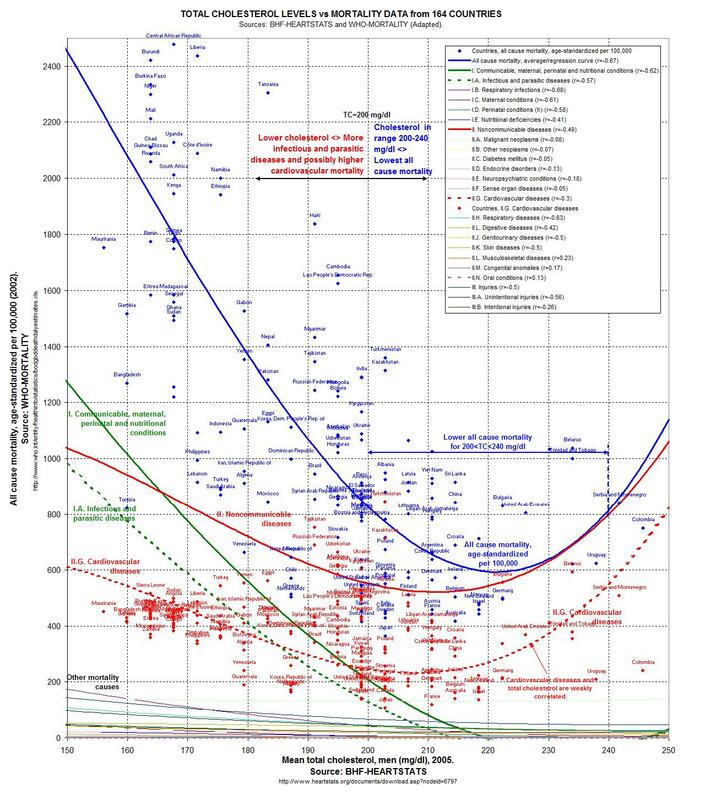 Here is an interesting chart plotting causes of death worldwide along with cholesterol levels. The chart shows a sharp increase in mortality with lower cholesterol levels. One reason for the high mortality rates with low cholesterol is that cholesterol plays a role in protecting against infectious diseases. [ref] Don’t like charts? There is a large 10-year study out of Norway that found the lowest mortality between ~190 to 270 mg/dl (5 and 7 mmol/l). Eating cholesterol causes the body to produce less of it, and lowering cholesterol intake will trigger the body to make more of it. The majority of cholesterol in the body is synthesized in the liver, intestines, adrenals, and reproductive organs. It is a multi-step, complex process. Cholesterol synthesis is regulated through several processes, with one of the main ways being the SREBP protein, coded for by the SREBF1 and 2 genes. Other genes involved in your cholesterol levels include cholesterol transport and receptor genes. The Number Needed to Treat website has an extensive review of studies on statins, including the increased risk of diabetes and muscle pain. It is an interesting, well-crafted assessment of the risks and benefits which concludes that the risks from statins outweighs the benefits for most people. One of the well-studied genes related to cholesterol is CETP (cholesteryl ester transfer protein), which codes for a protein involved in exchanging triglycerides between LDL and HDL cholesterol. The rs708272 polymorphism is also known as Taq1B in studies. Those with the T (referred to as A or B2 in studies) allele generally have higher HDL cholesterol. In research studies, the polymorphism is usually referred to as Taq1B, and B2B2 is the same as rs708272 – T/T. A 2009 study investigated the effect of the Taq1B polymorphism (rs708272 – T) for both HDL levels and the risk of heart attack. That study (18,000+ women) showed an average increase in HDL level per T-allele and reduced risk of heart attack. A 2016 meta-study confirmed this increased HDL and reduced heart attack risk in Caucasians and Asians. Another polymorphism of the CETP gene, rs5882 or I405V, is linked to HDL cholesterol levels and lower risk of dementia. The 2010 study on dementia, published in the Journal of the American Medical Association, found that those with the G allele had a slower rate of memory decline and that homozygotes had a 70% reduction in risk of dementia! One more SNP near the CETP gene also is associated with higher HDL levels. The PCSK9 gene is being studied for the effects of polymorphisms on LDL levels. There is a fairly in-depth video with nice visuals here. One well-studied gene variant that decreases LDL levels is rs11591147. 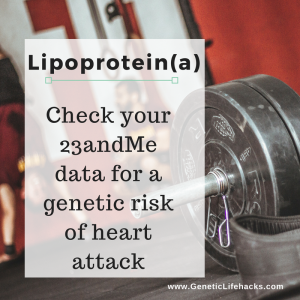 A 2012 meta-study showed that the T allele significantly lowers the risk of cardiovascular disease (28% risk reduction) and corresponds to a lower LDL cholesterol level (avg 16mg/dl). This is a ‘loss of function’ mutation for the gene. Some fairly rare mutations in the LDL receptor gene are pathogenic for familial hypercholesterolemia. 23andMe data only covers a few of the over 400 mutations known. A genetic variant in the HMGCR gene affects how well people respond to statins. A whole foods diet and moderate exercise are beneficial for keeping cholesterol levels in check. Yep – standard advice to cut out pre-packaged / fried food and go out and take a walk. While the old advice to give up eggs is no longer the case, cutting out the processed food should decrease inflammation and lower cholesterol levels a bit. Interestingly, a recent study found no correlation between fruit and vegetable intake and cholesterol level. Red cabbage microgreens were found to reduce LDL levels. [study] Microgreens are very simple to grow at home in a sunny window or under a LED grow light. A recent study found that pomegranate juice raised triglyceride and LDL levels, but lowered blood pressure. So you may want to skip the pomegranate juice right before a cholesterol test. Professor, Neuroscientist, and Cardiovascular Disease Researcher has published about LDL levels? Debunks high LDL as risk as well as familial hypercholesterolemia. Yes, I have seen David Diamond’s writing on why he doesn’t think that high cholesterol is a problem for people on the ketogenic diet. And he does cite a few studies on familial hypercholesterolemia that show little increase in mortality rate. But the majority of studies on familial hypercholesterolemia do show that it increases the risk of heart disease… I would encourage you to dig into the studies on pubmed.gov- there are about 9,000 that come up on the topic. I would also encourage you to look at the studies on hypocholesterolemia (low cholesterol) that are fairly consistent in showing that having lower cholesterol over the course of a lifetime decreases the risk for heart disease. The cholesterol topic is not a simple one that is easily pigeonholed into simple categories. Although the evidence seems to point towards a causal connection between cholesterol in heart disease, a closer examination of the issue may make us skeptical of this conclusion. The evidence about the association between high LDL levels and heart disease is more complicated than it first appears. A follow-up from the initial Framingham study suggested that there was only an increase in mortality, by heart disease or other causes, in people with higher cholesterol levels under the age of 50. Yes, the follow-up from the Framingham study shows an increase in mortality for people with higher cholesterol under the age of 50. Which, along with other studies, points to life-long higher cholesterol (e.g. due to the genetic mutations in APOB and PCSK9 listed above) as a significant risk factor for CAD. Thank you for this great information Your health will always be your top priority. Always eat healthy and live a healthy lifestyle.